Kitchen Love | "On Dragonfly Wings with Buttercup Tea"
Summary Posts for Kitchen Love: here. See below in the comments section for ideas on how to share our nurturing love with others through creativity in our kitchens. Please feel free to comment or contribute! 1. Preheat oven to 325 degrees F. Spray bottom and sides of an 8 or 9-inch square pan with cooking spray. 2. Prepare the caramel topping: In a small saucepan, melt the butter over medium heat, stirring occasionally. Stir in the brown sugar. Heat to boiling; remove from heat. Stir in 1/2 teaspoon cinnamon. Pour into the pan; spread evenly over the bottom of the pan. Arrange apple wedges over the brown sugar mixture, overlapping and layered as needed. 3. Prepare the cake batter: In a medium bowl, whisk together the flour, baking powder, cinnamon and salt. Set aside. In a large bowl, use an electric mixer to beat the sugar and butter, beating until fluffy (scrape down sides as needed). Beat in the eggs until smooth. Add the vanilla. Gradually beat in the flour mixture alternately with the milk, beating after each addition until smooth. Spread the batter evenly over the apples. 4. Bake 50 to 55 minutes, or until a toothpick inserted into the center comes out clean. Cool for 15 minutes, then run a knife along the edges of the pan to loosen the cake. Place a serving plate upside down over the pan; turn plate and pan over, and remove the pan. 5. Serve warm pieces with sweetened whipped cream (beat 1 cup of cream with a heaping tablespoon of powdered sugar until it reaches whipped cream consistency). High Altitude changes (3500 to 6500 feet): Change oven temperature to 350 degrees. Increase flour to 1 1/2 cups. Decrease sugar in cake to 3/4 cup. Mix lemon juice, sugar and water in a small saucepan. Heat until sugar is dissolved. Chill lemon juice mixture, and ginger ale. Pour chilled lemon juice mixture over mint leaves. Chill for 1 hour. In a large pitcher combine lemon juice – mint mixture with ginger ale. Add ice. Stir vigorously until well combined, and pitcher is chilled. 1. Preheat the oven to 450 degrees F. Lightly dust a baking sheet with flour. 2. Sift the flour, baking soda, and salt into a large bowl. Stir in the sugar and the dried fruit. 3. In a separate bowl, beat together the egg and buttermilk. Make a well in the center of the dry ingredients and pour in the liquid mixture. Use one hand stretched like a claw to mix the dough and combine until all is moistened (don’t try to knead it or it will be too heavy). The dough will be soft but not too wet and sticky. 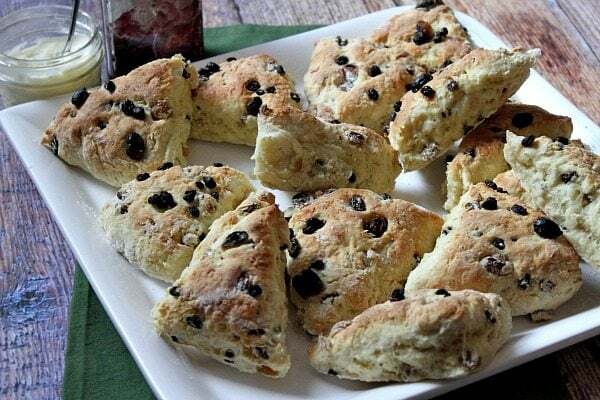 “Good Morning” – Easy Scone Recipe! Pingback: National German Chocolate Cake Day | "On Dragonfly Wings with Buttercup Tea"
Mix sugar, salt, and milk in heavy saucepan. Cook without stirring to 234 degrees F or until mixture forms soft ball when tried in cold water. Remove from heat. Let stand until cool. Add vanilla and peanut butter when ready to beat. Beat with wooden spoon or work with spatula on marble slab until fudge loses its glossy appearance, and is thick and creamy. Pour 3/4 inch thick in buttered pan, about 8×4 inches, and mark in squares. Makes 18 large pieces or 1 1/2 lbs. Hi Rebecca, I love your Facebook … lots to explore. Love your quotes and will try out the blueberry muffin recipe! I really enjoyed getting to know you and Donna on the cruise. You’re truly an inspiration to all women! Take care and keep in touch. Bless you! OMG — these are de-li-cious mini pecan pies!! Grease muffin pan (whatever size) or use the silicone cups. Option: when you take them out of the oven, place a slice of butter on top and eat warm. (I did not dare! :-)) You may also use walnuts instead of pecans. Pingback: Time for Baking – Day 10 | "On Dragonfly Wings with Buttercup Tea"
Pingback: Friendship Bread Starter – Day 6 | "On Dragonfly Wings with Buttercup Tea"
Pingback: Friendship Bread Starter | "On Dragonfly Wings with Buttercup Tea"
For instructions for Day 1- 10, and the recipe for Amish Friendship Bread, click here. I freeze the “batter” in the correct amount for a recipe — When the desire hits – I pull out a bag and allow to get to room temperature; makes it quick and easy whenever I want a loaf … Thank you for stopping by for a visit. Take a favorite cookbook, dust it off if it has been awhile and choose a recipe to prepare for yourself and/or your family! Enjoy!! Do you still have a large collection of cookbooks? Pingback: Today in Food History – July 11th | "On Dragonfly Wings with Buttercup Tea"
Pingback: Today in Food History – July 5th | "On Dragonfly Wings with Buttercup Tea"
Cook apples till done and add sugar and cinnamon to taste. Open and separate crescents on wax paper. Add apple mixture in to middle of each crescent. Fold crescent over mixture and seal. Note: You could use your favorite dough as a substitute for the crescent rolls. Pingback: Today in Food History – May 26th | "On Dragonfly Wings with Buttercup Tea"
Add cream cheese, eggs, lemon zest, lemon juice and sugar to the food processor and mix until well combined. It should have a smooth consistency. Pour onto the cooled base and then cover with blueberries. They will sink slightly but should still be half exposed — as the cake bakes they will sink a little more and break down. Oh, yum! Lots of good stuff here. 😀 … an area of delight!! Pingback: Today in Food History – April 13th | "On Dragonfly Wings with Buttercup Tea"
A Personal Note: I like to add a squeeze of fresh lemon to bring out the flavor of the peaches and 1 teaspoon of almond extract! Pingback: Today in Food History – April 6th | "On Dragonfly Wings with Buttercup Tea"
Bring to brown sugar, butter, and syrup to a boil; add 1 can sweetened condensed milk. I continue to cook for another couple of minutes, stirring constantly because it will burn easily. Pour over popcorn. anything made with condensed milk is divine!! YUM ~ enjoy! Pingback: Today in Food History – April 2nd | "On Dragonfly Wings with Buttercup Tea"
Combine dry ingredients. Add milk and peanut butter. Pour into a greased 8x4x3-inch loaf pan. Bake for approximately 50 minutes. Serve with your favorite jam. Pingback: Today in Food History – March 26th | "On Dragonfly Wings with Buttercup Tea"
1. Heavily butter a 15-in. x 10-in. x 1-in. pan; set aside. Heavily butter a large bowl; set aside. In a stand mixer, beat egg whites until stiff peaks form. In a heavy saucepan over medium heat, combine the sugar, corn syrup and water. Cook and stir until sugar is dissolved and mixture cones to a boil, about 10 minutes. (If sugar crystals are present, cover and boil for 1-2 minutes to allow steam to wash crystals down.) Cook, without stirring, until a candy thermometer reads 238 degrees F (soft ball stage), about 6-8 minutes. 2. With mixer running carefully and slowly add hot liquid in a steady stream over egg whites. Beat 10 minutes longer or until mixture holds its shape and is lukewarm. (Mixture will be beginning to lose its gloss.) Transfer to prepared bowl. 3. For almond mixture, in a large heavy saucepan over medium heat, combine sugar and corn syrup. Cook and stir until sugar is dissolved and mixture comes to a boil, about 15 minutes. (If sugar crystals are present, cover and boil for 1-2 minutes to allow steam to wash crystals down.) With a clean spoon, cook and stir over medium-high heat until a candy thermometer reads 275 degrees F (soft-crack stage), about 15 minutes longer. 4. Pour over mixture in bowl (do not scrape saucepan). With a large wooden spoon, stir until blended. Combine butter and vanilla; gradually add to almond mixture until blended. Transfer to prepared pan. Let stand at room temperature for several hours or until firm. Cut into squares. Wrap in plastic wrap or waxed paper if desired. Editor’s Note: A heavy-duty stand mixer is needed for this recipe. Egg whites were beaten with a whisk attachment and hot liquid was added using a paddle. 1.Mound the flour and salt together on a work surface and form a well. Beat the teaspoon of olive oil, 2 eggs, and water in a bowl. Pour half the egg mixture into the well. Begin mixing the egg with the flour with one hand; use your other hand to keep the flour mound steady. Add the remaining egg mixture and knead to form a dough. 2.Knead the dough until smooth, 8 to 10 minutes; add more flour if the dough is too sticky. Form the dough into a ball and wrap tightly with plastic. Refrigerate for 1 hour. 3.While the dough is resting, prepare the ravioli filling. Combine the ricotta cheese, cream cheese, mozzarella cheese, provolone cheese, egg, and parsley and mix well. Set the filling aside. 4.Heat 2 tablespoons of olive oil in a skillet over medium heat. Add the crushed garlic and pesto sauce and cook for one minute. Pour in the heavy cream, raise the heat to high, and bring the sauce to a boil. Reduce the heat and simmer for 5 minutes. Add the Parmesan cheese and stir until the cheese melts. Remove the pan from the heat and keep warm. 5.Meanwhile, in a separate saucepan, warm the marinara sauce over medium-low heat. 6.Preheat an oven to 375 degrees F (190 degrees C). Beat the egg with the tablespoon of water to make the egg wash.
7.Roll out the pasta dough into thin sheets no thicker than a nickel. To assemble the ravioli, brush the egg wash over a sheet of pasta. Drop the filling mixture on the dough by teaspoonfuls about one inch apart. Cover the filling with the top sheet of pasta, pressing out the air from around each portion of filling. Press firmly around the filling to seal. Cut into individual ravioli with a knife or pizza cutter. Seal the edges. 8.Fill a large pot with lightly salted water and bring to a rolling boil over high heat. Stir in the ravioli, and return to a boil. Cook uncovered, stirring occasionally, until the ravioli float to the top and the filling is hot, 4 to 8 minutes. Drain well. 9.Grease a baking sheet. Place the cooked ravioli on the sheet pan and bake in the preheated oven until brown, about 4 minutes. 10.To serve the ravioli, divide them among four warmed serving bowls. Drizzle the marinara sauce over the ravioli and then top with the cream sauce. In a medium bowl, toss together all the ingredients except the feta. Add the feta and toss gently. -1894 Coca Cola was first bottled by Joseph A. Biedenham of Vicksburg, MS. Prior, it was only mixed to order at the soda fountain. – 1929 Asa Griggs Candler died. In 1887, Asa Candler, a wholesale druggist, purchased the formula for Coca-Cola from John S. Pemberton, an Atlanta pharmacist, for $2,300. He sold the company in 1919 for $25 million. How many flower visits do honey bees have to make to produce 1 kilo (2.2 pounds) of honey? (d) One kilo of honey represents 4 million visits to flowers by honey bees. HEAT oven to 300°F. Combine butter, graham cracker crumbs and sugar in medium bowl. Press onto bottom of ungreased 9-inch springform pan. BEAT cream cheese in large bowl with electric mixer until fluffy. Gradually beat in sweetened condensed milk until smooth. Add remaining ingredients, mixing well. Pour into prepared pan. BAKE 65 minutes or until center is set. Cool to room temperature. Chill thoroughly. Garnish as desired. “Many people love cheese doodles for their delicious taste and crunchy texture. Cheese doodle varieties include puffed, crunchy, white cheddar, and crocodile shaped (seriously!) …” I love the puffed ones for melt in your both junk food treat, and I love the crunchy ones too. Haven’t seen the crocodile shaped ones – yet! Nothing beats … orange fingers while eating them!!! Oh, yummy day … with a mug/cup of hot tea or steaming dark roast coffee … now I am ready to take on the world! – Banana Cream Pie Day! 1. Preheat oven to 400 degree F. Coat insides and rims of four 6-ounce ramekins with nonstick cooking spray. Sprinkle with sugar and set on a baking sheet; set aside. 2. In a small microwave-safe bowl, combine chocolate and cream. Micro-cook on 100 percent power (high) for 1-1/2 to 2 minutes or until smooth, stirring twice. Divide in half. Cover and cool to room temperature. 3. In a medium mixing bowl, beat egg whites with an electric mixer on medium speed until foamy. Gradually add sugar, beating until soft peaks form (tips curl). 4. Gently fold half of the cooled chocolate mixture into the beaten egg whites until combined. Spoon mixture into prepared ramekins. Bake for 12 to 15 minutes or until a knife inserted near the center of soufflés comes out clean. Serve immediately. To serve, open the centers of the souffles with two spoons and pour in remaining chocolate mixture. Makes 4 servings.